No matter what the nature of your business, email design is one of the most critical parts of your email marketing strategy. It is not enough to simply get recipients to open your emails – you need them to stick around long enough to see what you have to say. The right email template can make all the difference in the world, especially now that so many people are reading their email on smartphones, tablets and other handheld devices. The email templates you use should be adaptable enough to handle the wide range of devices on the market and give every viewer the same great experience. Keeping things simple for your readers should always be a top priority. The email templates you choose should allow you to customize your messages and format them in a way that will stand out while providing real value to those on your mailing list. You can use the right styling to draw readers’ eyes to key areas, while separating the most important information into small and easy to read paragraphs. SendBlaster 3 comes complete with more than 250 professionally designed HTML email templates, including 100 completely new email templates and 30 responsive email templates (180 email templates in the Free edition), all sorted and categorized to make using them even easier. Every one of those 250 email templates has been fully verified and tested, so you can be sure they will work with all the popular email clients on the market, including Yahoo! Mail, Gmail, Hotmail, Outlook 2007, Outlook 2010, etc. No matter which email client your recipient uses, the emails you create with our professionally designed templates will look great. Using these email templates is easy. All you need to do is choose your favorite one and customize it with the content, images and links you want to use. It really is that simple! 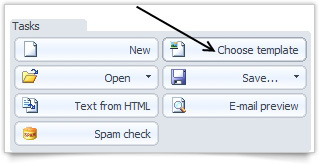 To get started, just open SendBlaster 3 and find the Compose Message panel. Click on Choose Template to continue. From there you can choose your favorite template from each of the available categories. Categories include business, sports, entertainment, technology and food. 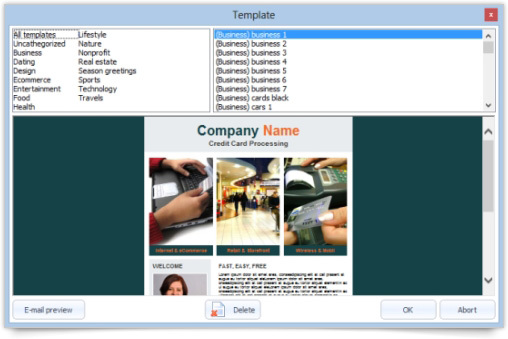 You can select the perfect template from hundreds of different designs across many different categories. Just look at the various designs and layouts and choose the one that best fits your needs and the needs of your business. You can use these HTML email templates for not only your newsletters but a variety of different occasions as well. From email promotions and email invitations to holiday greetings, there is a template for every need. There is no need to write complicated source code. Even newbies will be able to choose a template, add their custom content and see the results – all without writing a single line of code. At the same time, experienced programmers can edit HTML code using the inline editor included with SendBlaster 3. Our email templates are also compatible with many other HTML editors, including Adobe Dreamweaver and the free Kompozer product. You can also use SendBlaster to save the templates you have already created. All you need to do is save the message as a template. From then on, you will see that custom template every time you open up your list. Not enough time to create or customize your email template? 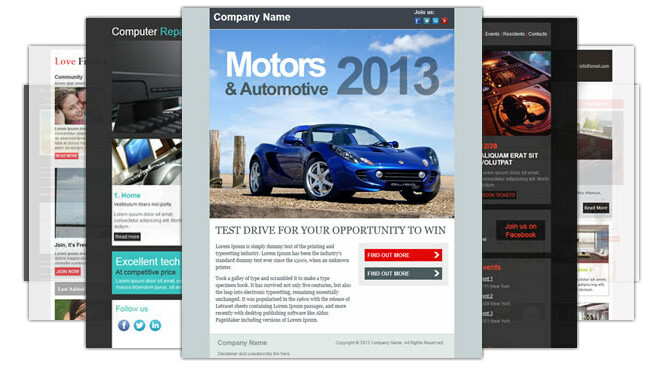 We can help you create a custom designed email template as well. Our team of web designers can work for you to design your unique email template based on your preferences and your needs.